Komplett ready to start full scale online pharmacy from January. Reporter December 18, 2015 December 18, 2015 Comments Off on Komplett ready to start full scale online pharmacy from January. 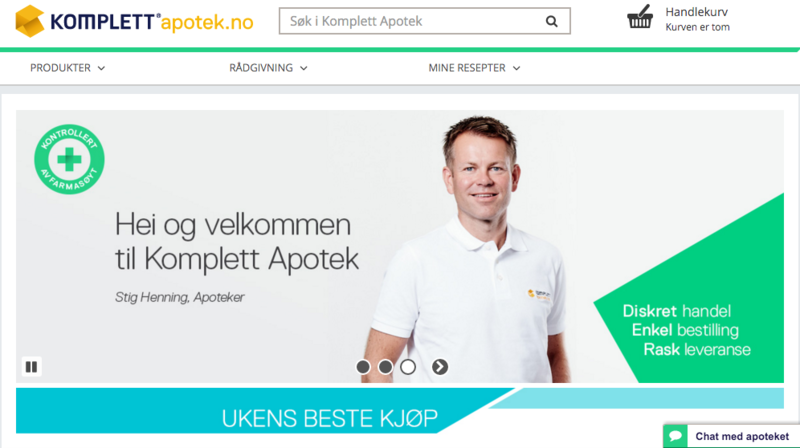 Komplett Pharmacy aims to become Norway’s Apotea, the Swedish online success. A change in the law gives Komplett the amittance to sell prescription medicines online. Now the goal is to become Norway’s largest pharmacy. Until 31 December 2015, prescription drugs can only be sold in physical stores in Norway. But January 1, 2016 a legislative amendment in Norway makes it possible to sell prescription medicines online. Now the plan is to slowly but gain an increasing part of the Norwegian pharmaceutical market, which Komplett estimates is worth 22 billion NOK. The first goal is to reach five percent in five years. The three major pharmacy chains in Norway are Apotek1, Boots and Vitus. Komplett believe they have found a slot for a Norwegian online actor, which in addition to competitive price also can offer a discreet shopping experience. “Apotea were in the same situation as us. They also challenged the established chains and sold only non-prescription for a start. We know there is a big market for it in Norway too, but we believe it is with the prescription products that customers really will turn to the network. “Says Stig Henning Pedersen. Regarding the discrete conduct says Stig Henning Pedersen that many questions will be easy to handle via chat that is encrypted, making the customer anonymity. Something he believes is more private than standing in a queue of people behind their backs. He does not believe that it is the price that will be the main driving force for customers to choose to shop online. But to offer prescription drugs will account for a larger growth. Komplett also provides a physical pharmacy service at the warehouse in Sandefjord, which remains a legal requirement. In addition, pharmacies in Norway are not allowed to send medicinces directly to a mailbox. Moreover, one must document who’s picked up the delivery. Komplettapotek.no is owned by Komplett Pharmacy AS which is a part of Komplett Group.